Although it is more common in children, fidgeting is also seen adults. When fidgeting habits continue past childhood, they become increasingly more difficult behaviors to break. Fidgeting, when not controlled, can be distracting to the fidgeter and others around them. This oftentimes has negative effects on an individual’s professional and social performance. However, there are ways to help you manage, if not stop, fidgeting habits. By determining the causes of, becoming conscious of them, and practicing relaxation techniques, many of these behaviors can be suppressed or eliminated. 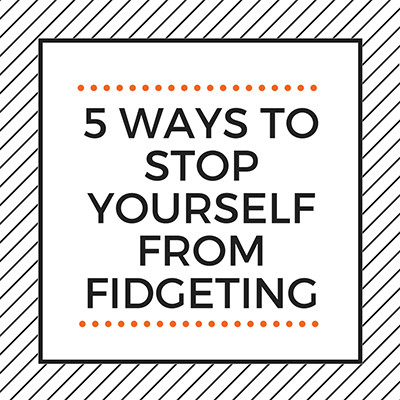 Here we’ll share some common ways to stop yourself from fidgeting. It is important that you first identify why you fidget. By determining what triggers these behaviors, you are able to counteract them and/or minimize their frequency. It’s worth mentioning that fidgeting is a completely normal behavior; it’s just that some fidget more than others. So don’t be too hard on yourself! Though individuals with high levels of stress, increased anxiety, and hyperactivity are much more susceptible to fidgeting than those without. Is there a consistent pattern? Do you mainly fidget during work hours? Is it during meetings? Do you fidget more in the morning or in the afternoon? Does a certain event or place cause you to fidget more? Does coffee or caffeine increase the intensity? Does sugar or some other food? What parts of your body does it affect most? Hands? Mouth? Feet? Hands? Answering these simple questions will help you pinpoint the causes so you can find the best solution or coping mechanism. Try keeping a notebook or journal where you document these things. Log the times and places where you fidget and maybe include the intensity of the fidgeting. Triggers can vary greatly from one person to the next, so this activity will help you recognize your own personal triggers. For some of us, fidgeting happens because of pent-up restless energy. Maybe you’re in a meeting that you can’t get out of and you can’t stop thinking about that project deadline that’s rapidly approaching. Or maybe you’re stuck in traffic and are going to be late to your kids soccer game. During these times of over-stimulation, your mind is racing. Your body is getting worked up. Thoughts are whirling through your head. Enter fidgeting. Just relax. Take some deep breaths and remind yourself that many things in life are outside of our control. Identify the thoughts that are coming into your mind, acknowledge them, and push them aside. Relaxation doesn’t only keep the fidgeting at bay, but it also has other benefits such as lowering stress levels and lowering blood pressure. Another way to stop fidgeting is to keep your hands busy in non-disruptive ways. There are a number of fidgeting toys and devices on the market that are designed for this specific purpose. Inconspicuous fidgeting. You can satisfy your fidgeting desire through gratifying actions without disturbing others around you. Many of these involve spinning, flipping, and rolling small objects. No matter what the reason for your fidgeting – whether be it anxiety, tiredness, or just having too much energy – everyone can benefit from exercise. Increasing your level of exercise has obvious positive impacts on your overall health but can also dramatically reduce your desire to fidget. Top that off with a good restful night’s sleep. A fresh and well-rested mind can much more easily cope with fidgeting tendencies. The of the last ways to help stop fidgeting is to be mindful of your caffeine and sugar intake. Caffeine, when ingested, gives you that kick – that is why so many drink it during the morning. Sugar, on the other hand, is an energy-giving food. When you consume more sugar and/or caffeine than you should, you will have a lot of energy. Thus increasing your fidgety potential. Be mindful of how much of each you bring into your body. According to nutritionists, 400mg of caffeine a day (roughly 4 – 8oz cups of coffee) is a safe amount for most adults. The American Heart Association (AHA), suggests the maximum amount of added sugar an adult should consume in a day is as follows: Men: 150 calories per day (37.5 grams or 9 teaspoons) and Women: 100 calories per day (25 grams or 6 teaspoons).